Our graduating students continue to leave remarkable legacies and accomplishments. This year, we are proud to share the following highlights from our graduating class: (1) 66 graduating seniors, (2) 228 offers of admission to 114 of the finest universities and colleges, (3) Offered merit-based scholarships totaling $7,933,640, and accepted $2,179,788, from numerous colleges, corporations, and local organizations. The following represents some of the data found in our Upper School Profile. 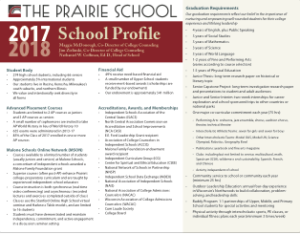 For a copy of the School Profile, click the icon on the right of this page. Prairie’s graduates of the Class of 2014 have been accepted to a total of 75 colleges and universities. Prairie’s 61 graduates of the Class of 2013 have been accepted to a total of 113 colleges and universities. Prairie’s 76 graduates of the Class of 2012 have been accepted to a total of 294 colleges and universities.